Way back in 2015, we published an article '5 tips for photographing waterfalls' that was a basic guide for taking a photo for novice photographers. In this article we've decided to expand on what was previously written, and try explain some of people's misconceptions with regards to photography. In our Facebook Group a discussion thread occasionally is created by members asking what other people's preferences are for waterfall photos. They will often ask if people prefer 'natural' photos or 'edited' photos of waterfalls. A healthy discussion always occurs, and people express their personal preferences regarding photography of waterfalls. What is a 'natural' waterfall photo? Firstly, every camera utilises what is known as 'Exposure'. The exposure is the amount of time the shutter of your camera is opened to allow the scene to be seen before it closes again. Smart phones and instant cameras tend to have a very short exposure, meaning that only a fraction of a second is captured by the camera. The camera then 'edits' the scene to try and make that scene look as good as possible. However, different cameras have different exposure times, and on many cameras, you can manually adjust the exposure time. 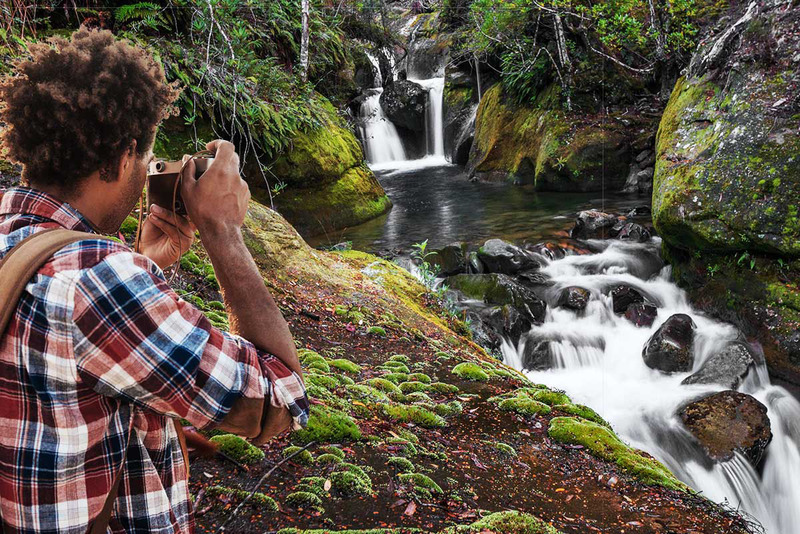 When photographing scenes that have motion, such as water flowing over a waterfall, a short exposure will take a photo with droplets of water appearing to be suspended mid air. With a longer exposure, you will not see the droplets, but will see an abstraction of 'flowing water'. The longer the exposure, the greater influence the motion has on your photos. Regardless of the exposure times you use for photography, the photo is not edited. It is still a photo. Another misconception is instant photos make a scene look natural. If you take a photo of a waterfall with your smart phone, and then look at the photo, and look back at the scene you just photographed, you will clearly see that it doesn't look the same. It will look similar (most photos do) but it will not be the same. Colours will vary, highlights and shadows will differ, and in some cases, the way you perceive the scene you are looking at will be perceived differently in a photograph. So, what is a natual photo? There are many different view points, all of which have merit. Our viewpoint at Waterfalls of Tasmania is that a 'natural' photo is one that represents not just the look of a waterfall, but the feeling it gives you as accurately as possible. There is also an artistic element to it as well. Many images, waterfalls or not will leave you with a feeling, an emotion. You can have two photographers, standing side by side, photographing the exact same waterfall, and each photo can leave you with different emotions. In other words, a photo is more than what you see, it is an experience, and a good photographer will try to reflect what he or she has experienced in their photo. To be able to achieve that, editing of photos is necessary. Taking a photograph is only part of what is required for photography. But edited photos are fake, right? For some people, taking a photo for them to remember a place or an event is perfectly sufficient. For others, sharing that experience with others is what is important to them, and editing of photos can help perfect that experience. But if you edit a photo, does it make it fake? Cameras are not perfect. They are incredibly good at producing fabulous images but they just can't get it perfect. Every photo you take will be imperfect, and every photo will have something that possibly should be corrected. A classic example is what we touched on above with shadowed areas being very dark, and bright areas within the photo being over exposed. Some of these anomalies can be corrected when editing (called post processing) a photo. Correcting colours and lighting in an image isn't making the photo fake, but is in fact correcting it. A skilled photographer or photo editor will have the knowledge and distinction to know when they are changing an image too much. Problems do occur when post processing has gone too far. I colloquially use the term 'over baked' when I see a photo that has been over processed, or not processed correctly. In fact I look at many of my own photos I edited some time ago and can instantly see where I could have processed it better. I recently went through many of my old waterfall photos, and completely re-edited many of them. And I was astounded at how improved some of them now look. What were my mistakes? The water in the waterfall in my photo was blue or had a blue tinge to it. This is not what I see when I look at a waterfall. Unrealistic colours. Greens on trees, mosses and grasses were 'greener than green', and looked completely unrealistic! Somehow, they tend to be great for 'likes' on FB, but I'm not in it for the 'likes'. I want my photo to look more like the reality. Use 'saturation' and 'vibrancy' sparingly. The color balance of the photo was incorrect. Sometimes the temperature settings of a photo will be cool, other times warm, and it depends on the settings you're using on your camera. Many of my processed photos from a few years ago were clearly incorrect. How can you tell if the color balance is incorrect? Look at the tinge of the photo, and see what color it is. Is it yellowish? The Color Balance is too warm, and needs toning back. Is it too blue? You need to make it warmer! Dark photos - A waterfall photo should often be bright and vibrant. Many of my early editing efforts needed to be corrected to increase the overall brightness. Avoid bright sunlight on waterfalls. Use a Polarizing Filter on your lens to help suppress glare. Be mindful of wind and movement in foreground and backgrounds when taking your photography. Ensure your camera is level with the horizon. Many tripods and cameras will have some kind of level to help you get your camera perfectly straight. If your camera allows, shoot in RAW mode, especially if you plan to edit your photos later. Make sure the color balance of the photo reflects what you saw. Correct under exposed, and overexposed areas of your photo by adjusting the exposure levels of highlights and shadows. Avoid over saturation. If in doubt, do not increase saturation. Ensure your photos are bright enough to be easily seen. Use professional editing software such as Adobe's Lightroom and Adobe's Photoshop.